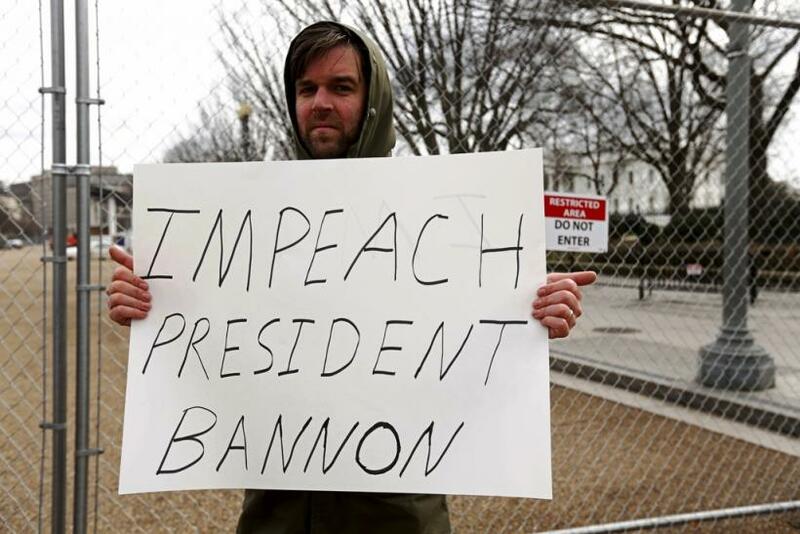 “Impeach President Bannon” posters have cropped up across New York City, Washington, D.C., San Francisco and Baltimore demanding the removal of President Donald Trump’s chief political strategist Steve Bannon, according to reports Sunday. The former executive chairman of Breitbart News is accused of influencing Trump, who has rubbished the claim. The posters are courtesy of a campaign that is calling on Bannon’s removal from the White House. So far the campaign has raised more than $13,500 for the posters, which includes the 63-year-old in the list of U.S. presidents since Ronald Reagan. After Barack Obama, Trump's name was replaced by Bannon's in the so-called list of presidents on the posters. “Our goal is to show Trump we know who is really ‘calling the shots.’ To spark a media firestorm and put another bale of straw on that camel’s back. It’s gotta break. Bannon’s got to go,” the California-based organizers said on the campaign page. Bannon, who does not hold an elected post, cannot be impeached. However, he can be removed as chief political strategist if Trump resigns or dies during the presidential term and the president’s successor chooses to change Trump’s staff. Several reports have said that Bannon has become one of the most powerful voices in the initial days of the Trump administration. He is being criticized for having ties to the alt-right movement. He was also in charge of the drafting of the travel ban on seven Muslim-majority countries that triggered protests across the country. Last month, Bannon told the New York Times that the media should "keep its mouth shut and just listen for awhile."